Once you have cut the bridle joints, dry assemble the frame and set it on the table base to ensure that it fits properly. There should be a % inch ledge all around the inside edge of the frame, which will support the lattice grid. Disassemble the frame and spread some glue on the tenons. 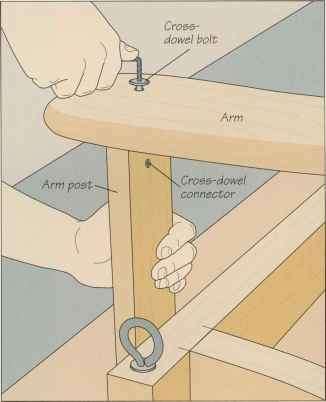 Reassemble the frame, check for squareness, and clamp each joint with a pair of clamps. Then round over the outside edges of the frame. To secure the frame in position, set it on the rails and arrange it to create an even % inch ledge. Hold the frame in place with a clamp in each corner and secure it with a screw in each pocket hole (left).